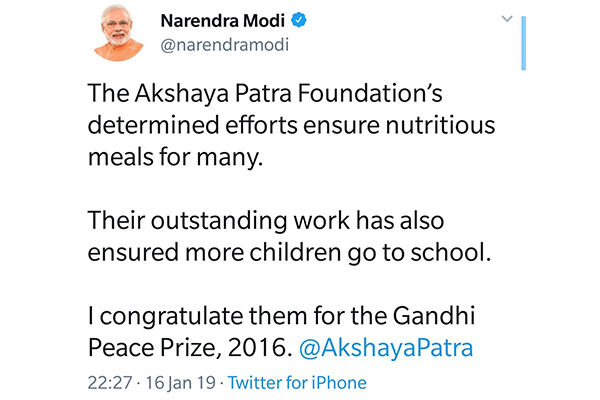 DELHI, India, January 21, 2019 – On Jan. 16, 2019, the esteemed Gandhi Peace Prize was conferred upon Akshaya Patra for their contribution in providing mid-day meals to millions of school children in India. The International Gandhi Peace Prize, named after Mahatma Gandhi, is awarded by the Government of India to individuals and institutions for their contribution towards social, political and economic transformation through non-violence and other Gandhian methods. The jury under the Chairmanship of Prime Minister Shri Narendra Modi and comprising of Justice Ranjan Gogoi, the Chief Justice of India; Smt Sumitra Mahajan, Speaker of Lok Sabha; Shri Mallikarjuna Kharge, Leader of the single-largest Opposition Party in Lok Sabha; Shri L.K. Advani, Member of Parliament, unitedly announced the award. The award is an annual prize but no winner had been conferred the honor since 2014. The announcement of the award on Jan. 16 encompassed 2015-2018. The award was instituted in 1995 during the commemoration of the 125th birth anniversary of Mahatma Gandhi. It carries an award of Rs one crore along with a citation and plaque. Previous winners of the Gandhi Peace Prize include Nelson Mandela, Desmond Tutu, Vaclav Havel, Ramakrishna Mission and other venerable individuals and organizations. Akshaya Patra means the unlimited bowl of abundance and sustenance. Started in 2000, the pilot program served 1,500 children daily in five schools. Today, the organization feeds 1.76 million school children daily in 14,702 schools across 12 states. The state-of-the-art kitchens provide fresh, nutritious hot meals to counter the issues of malnutrition and support the right to an education for children from socio-economically deprived backgrounds. To learn more about The Akshaya Patra Foundation, please visit www.FoodForEducation.org.